Picture yourself in this new and pristine Coastal home in the amenity-rich community of Millville by the Sea. 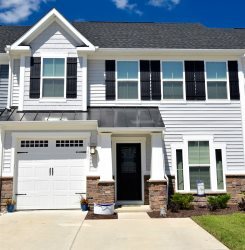 This spacious brand new house boasts 5 bedrooms, 3 full baths, and sleeps 10. Rustic hardwood flooring in the main living areas and granite counter tops and stainless steel appliances. Check-in is a breeze with your personalized keyless entry code. There are 2 spacious common areas (each on a separate floor) for down time relaxing, doing a puzzle, or watching something on the smartTVs. No need to fight over the remote! Outdoors you will find a screened porch looking out over a lake in the back and a relaxing place to chat on the front porch. This home lends equally well to a family with young children on vacation to a group of men or women on a beach or golf retreat. Enjoy Our recommendations for all of the best local places to eat, shop, and play for every type of guest group in our personalized guide. Just 4 miles from Bethany Beach, Millville by the Sea is close to the shore, yet away from the hustle and bustle. amenities include multiple pools, lounge poolside, socialize, and play. BEACH SHUTTLE runs from resort to Bethany Beach and back in season. 3 hours from Philadelphia, Baltimore, and Washington D.C., and 4 hours from New York City. Bethany Beach is just four miles away from Millville by the Sea, which offers a convenient shuttle service to our famed shoreline—and all its places to shop and dine. You can also reach Rehoboth Beach and Ocean City, MD in less than 35 minutes, and Fenwick Island in 20. Take a neighborly aerobics class—or catch up with friends over beer—without ever leaving your community. At our Lifestyle & Activity Center, residents work out and play hard in the resort-style pool with splash zone, during potlucks inside the Crab Shack, or while kayaking on the lake. Come for the coastal living, and stay for the thrill of living among friends. In Millville, a morning dip in the pool is followed by shopping trips to Bethany Beach, then back home for happy hour before dinner. A match of pick-up pickleball easily leads to lunch along the lake. Sure, our life along the water reflects our community spirit—but our indoor happenings are just as exciting. RESORT POOL: Outfitted with lounge chairs, umbrellas, and beach entry, plus a million ways for you to unwind. Its ideal location adjacent to Lake Summerwind and the playground means you won’t have to roam far for a change of pace. SAND DOLLAR POOL This intimate, 5-foot-deep neighborhood pool is located in Sand Dollar Village and features beach entry, tables and lounge chairs. You can also work out on dry land in the adjacent Exercise Cabana, with two treadmills, an elliptical machine, and an assortment of free weights. CRAB SHACK: Our community’s Crab Shack pavilion overlooks our glittering lake, providing a dream location for cook-outs and family dinners. OUTDOOR KITCHEN: If you’ve got a cook-out in mind, the outdoor kitchen includes a barbecue and large island for mixing and mingling. Work out more often and perfect your routine in a fitness center that’s close to home. Our sunlit, state-of-the-art space offers top-notch equipment and weights, a bright, private room for classes, and three flat-screen TVs with a fitness video library. Optional personal training will also keep you on your toes. CARDIO & STRENGTH TRAINING: Treadmills, elliptical, and stationary bikes offer our residents ways to de-stress and work up a sweat. You can also amp up your strength training on our weight machines, free weights, and benches. AEROBICS & YOGA: Dance classes like Zumba, plus yoga, and traditional aerobics are enjoyed inside an airy, private studio with a mirrored wall, ballet bar, sound system, and large flat-screen TV with a fitness video library. LAKE SUMMERWIND: Feel like you’ve slipped into a painting? That’s understandable. Neighbors find new levels of wonder on the gentle waves of our Lake Summerwind, home to paddle boarders, fishing enthusiasts, and lakeside loungers. LOUNGING LAKESIDE: Sit still and feel the Bethany breeze. Lounge along the water or take a walk on the lakeside trail. Picnics here also come with delicious sights. CLUBHOUSE: Neighbors can relax in the vibrant lounge space, watch a ball game, and get cozy by the fireplace. The Clubhouse—along with its kitchen—overlooks the lake and is also available for rental for private parties and meet-ups. The bike rack outside makes it even easier to ride on over. Find a great place to watch big games inside our pub. Explore community clubs ranging from poker to yoga. spacious, sun-lit fitness center is breathtaking in more ways than one. And its airy private studio is home to Zumba sessions and a large flat-screen TV with a fitness video library. RECREATIONAL PASSES are required to use the resort amenities. AS PART OF THE RESERVATION, YOU WILL RECEIVE 6 WRISTBANDS AND A KEY FOB allowing up to 6 of you at any one time to use the resort amenities AT NO CHARGE. If you need more than 6 people at any time to access the resort amenities, then renters may also purchase an additional wristbands from the resort after you arrive at a cost of $25 each. LINENS: We will supply mattress pads, pillows, blankets and comforters. YOU WILL BRING YOUR OWN SHEETS, PILLOW CASES AND TOWELS. You'll have your own washer and dryer inside the home that you are welcome to use. AS A POPULAR ALTERNATIVE, IF YOU WISH TO RENT LINENS, one local supplier of sheets, pillow cases and or towels is Gale Force Rentals with phone number of (Phone number hidden by Airbnb) and website of GaleForceRentals com - you should make linen rental arrangements well ahead of your trip if you decide to rent. * Note: XL Twin Beds will need either XL Twin Sheets or Queen Sheets. This is a brand new house and as of August 2018, there is likely to be some construction in the area nearby.